Councillors have agreed the grounds on which an appeal over refused plans for more than 50 new homes in Morpeth will be fought. A scheme for 53 properties on land north of The Garth, off Pottery Bank, was refused by the Castle Morpeth Local Area Council in February, against the advice of planning officers. 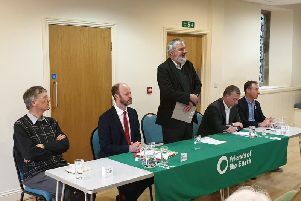 The reasons for refusal were a lack of information to assess whether it will have a ‘severe cumulative impact’ on the road network; that the site is not designated for housing in the Morpeth Neighbourhood Plan; insufficient information on flood risk; and the adverse impact on the amenity of residents at Pottery Bank Court. The applicant, Persimmon Homes, lodged an appeal in August and an inquiry has now been listed for June 4 to 7 next year. At the same time, a second application, for the same number of homes and with only minor changes, was also submitted to the council. However, this included revised versions of the transport statement and flood-risk assessment, and it is for this reason that councillors were advised to drop the highways and flooding refusal reasons. At Monday’s (November 12) meeting of the local area council, members eventually agreed that the authority should just defend the other two reasons at the appeal, but only after being briefed on legal advice in private. A report to councillors explained that following advice from counsel, it is not considered reasonable to defend the other reasons and ‘that to do so would place the council at significant risk of incurring substantial costs for unreasonable behaviour’. Earlier in the meeting, several members had put up a fight about dropping the highways reason for refusal, claiming that the ever-growing numbers of new homes in Morpeth were putting an increasing pressure on the road network. More generally on the road impact, he explained that the assessment shows the development would result in an extra one trip every three minutes – a negligible amount in transport terms.